What’s the Speed of Dark? The speed of light is one of the most important constants in physics. First measured by Danish astronomer Olaus Roemer in 1676, it was Albert Einstein who realized that light sets an ultimate speed limit for our universe, of 186,000 rip-roaring miles per second. But while the immutability of lightspeed is drilled into physics students at a young age, Einstein’s laws also state that all motion is relative, which got us thinking: what’s the speed of light’s nefarious doppleganger, darkness? We’re not the first to ask this question (shout out comedian Steven Wright) or take it seriously, but in asking scientists and researchers, we left the interpretation of “darkness” open, eliciting some fascinating responses from experts on black holes and quantum physics. It turns out, darkness could be just as fast as light, or it could be infinitely slower—it all depends on your perspective. The speed of dark? The easy answer is that it’s just the speed of light. Switch off the sun and our sky would go dark eight minutes later. But easy is boring! For starters, what we commonly call the “speed of light” is the speed of propagation, and that’s not always the deciding factor. A shadow swoops across the landscape at a speed governed by the object that casts it. For instance, as a lighthouse beacon rotates, it lights up the surroundings at regular intervals. The ground speed of its shadow increases with distance from the lighthouse. Go far enough away and the shadow will wash over you faster than the propagation speed of light. (This happens for real in rotating neutron stars in the cosmos, with measurable consequences.) All the speed of light means in this case is that there’s a delay: if the lighthouse points toward you at 12 o’clock, you will see the flash a little later. But that doesn’t affect the pace of events you see at your location. While we’re at it, is there even such a thing as darkness? If you did switch off the sun, Earth wouldn’t go completely dark. Light from stars, nebulae, and the big bang would fill the sky. The planet and everything on it, including our bodies, would blaze in the infrared. Depending on how, exactly, you’d managed to switch the sun off, it would keep on glowing for eons. As long as we were able to see, we’d see something. No light detector can register total darkness, because, if nothing else, quantum fluctuations produce tiny flashes of light. Even a black hole, the darkest conceivable object, emits some light. In physics, unlike human affairs, light always chases away dark. Darkness isn’t a physical category, but a state of mind. Photons hitting, or not hitting, retinal cells may trigger the experience, but do not explain the subjective experience of darkness, any more than the length of waves explains the experience of color or sound. Our conscious experience changes from moment to moment, but the individual frames of that experience are timeless. In that sense, darkness has no speed. And what about speed in general—is there such a thing? It presupposes a framework of space, and scientists see phenomena in quantum physics where spatial concepts seem not to apply—suggesting, to some, that space is derived from a more fundamental level of reality where these is no such as thing as position, distance, or speed. It must be the level that Steven Wright operates on. 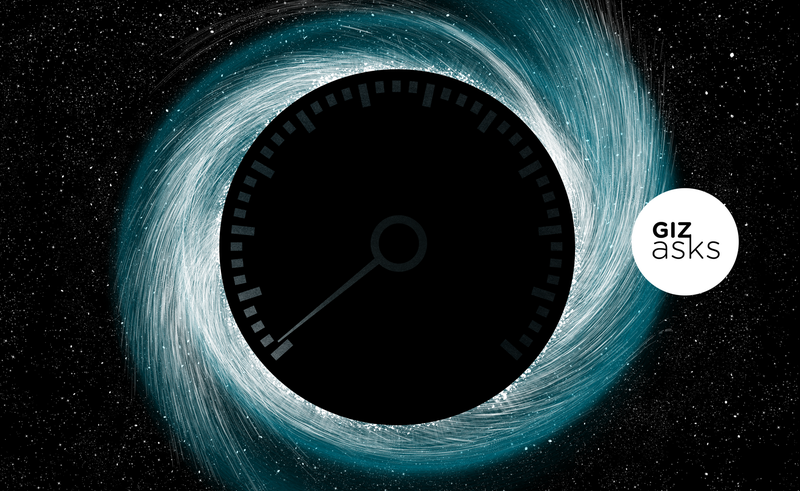 Close to a black hole, matter falls in at a speed that is close to the speed of light. Once it enters the so-called event-horizon of the black holes, nothing can escape. Even light is trapped inside the horizon forever. Hence a black hole can be thought of as the ultimate prison. A star like the Sun can be shredded (“spaghettified”) into a stream of gas if it passes too close to a massive black hole, like the one (weighting six billion solar masses) at the center of the Milky Way galaxy. As matter falls into the black hole, it often rubs against itself and heats up. As a result it radiates. If the accretion rate is high enough, the force of the radiation flowing out could potentially stop additional matter from falling in. Many of the most massive black holes in the universe, weighting billions of solar masses, are observed to accrete at the maximum possible rate (also called the Eddington limit, after Sir Arthur Eddington who discovered theoretically the maximum radiation output possible for gravity to overcome the radiation force). The speed of dark… Consider dark getting erased by light. The light erases it at the speed of light so the speed of dark would be negative the speed of light. If light is a vector, it has magnitude and direction, so… to call it negative means it’s in a negative direction. The dark is receding rather than advancing. I’d call it negative the speed of light. A black hole has gravity so strong that not even light can escape once it has passed the event horizon, an invisible boundary marking the point of no return. Because the black hole has such strong gravity, time dilation will affect observations from outside the strong gravitational field. For example, a distant observer watching a glowing object fall into a black hole will see it slow down and fade, eventually becoming so dim it cannot be seen. This observer won’t ever see the object cross the event horizon. We can also take the perspective of stuff falling into the black hole, instead of a distant observer. For example, if we take a black hole in the center of a glowing gas cloud, say from a star that has been broken up by passing too close to the black hole, the material will form a flattened disk, known as an accretion disk. This gas will fall into the black hole, but it is not instantaneous. There is a speed limit enforced by the radiation pressure from the hot gas which will fight against the inward force of gravity from the black hole. As the gas falls into the black hole, the black hole grows in size. If a black hole that is 10 times as massive as our Sun is accreting at the maximum allowed rate, in about a billion years it could have reached 100 million times the mass of our Sun. Basically, it depends on whether you’re the matter being consumed by the infinite abyss of a black hole or you’re far enough away to be a dispassionate observer watching someone else falling into the infinite abyss. If you happen to be the unlucky matter falling in, the speed is potentially very large, in principle approaching the speed of light. If you’re the observer and you’re far enough away, the speed with which matter is consumed is dramatically slowed down due to an effect known as gravitational time dilation—clocks run slower in gravitational fields, and much slower in the immense gravitational fields near the event horizon of the black hole. By ‘far enough away’, I mean that in your local reference frame, your stationary relative to the black hole (i.e, not getting sucked in) and your local clock is not affected by the gravitational field of the black hole. In fact, to the far away person it will take an infinite amount of time for something to travel to the event horizon of the black hole. I believe the speed “of dark” is infinite! In classical physics, the vast darkness of space could be just empty vacuum. However, we have learnt from quantum mechanics that there is no real dark or empty space. Even where there is no light that we can see, electromagnetic field can fluctuate in and out of existence, especially on small scales and short times. Even gravitational waves, the ripples in the geometry of spacetime that were recently observed by the LIGO observatory, should have these quantum fluctuations. The problem is that the gravity of these quantum ripples is infinite. In other words, currently there is no sensible theory of quantum gravity that people could agree on. One way to avoid the problem is if the speed “of dark”, i.e. the quantum ripples, goes to infinity (or becomes arbitrarily big) on small scales and short times. Of course, that’s only one possibility, but is a simple (and my favourite) way to understand big bang, black holes, dark energy, and quantum gravity. January 25, 2017 mannaismayaadventureWhat's the Speed of Dark?